The trend of luxury restaurant chains seems to be kicking off. Veda, the gourmet brainchild of designer Rohit Bal and restaurateur Alok Aggarwal recently opened its third branch at DLF Place Mall in South Delhi. The newest Veda sports a lighter, more spacious look than its earlier counterparts even while preserving the ornate essence of the original. 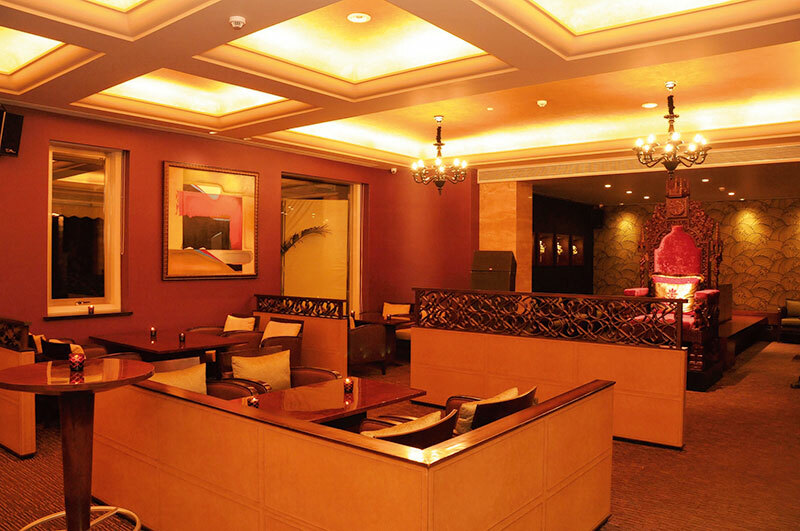 The contemporary-classic cuisine – international wines paired with innovatively tweaked classic Indian recipes like lamb chops marinated with pear chutney and spinach chaat – is complemented beautifully by the sumptuous interiors. Heavily adorned Venetian mirrors, dimly lit chandeliers, flickering candles and lavish gold throne chairs make for a royally romantic evening with a touch of Bal’s trademark whimsy and fantasy. The exquisite lotus-motif inlay work of the marble flooring draws inspiration from the rich craftsmanship of Mughal tradition as do the gorgeous red brick walls with images of peacocks and lotuses that echo Bal’s recent collection of anarkalis and sherwanis in velvets and brocades. The décor makes an unapologetic statement of pomp and splendour. Impossible to ignore. Intricate yet contemporary design finds its mark at Zest located on the third floor of Delhi’s luxurious shopping destination, Emporio. Designed by a Japanese firm, Super Potatoes, the restaurant is crafted around a Rafis palm tree which is tended daily by horticulturists. 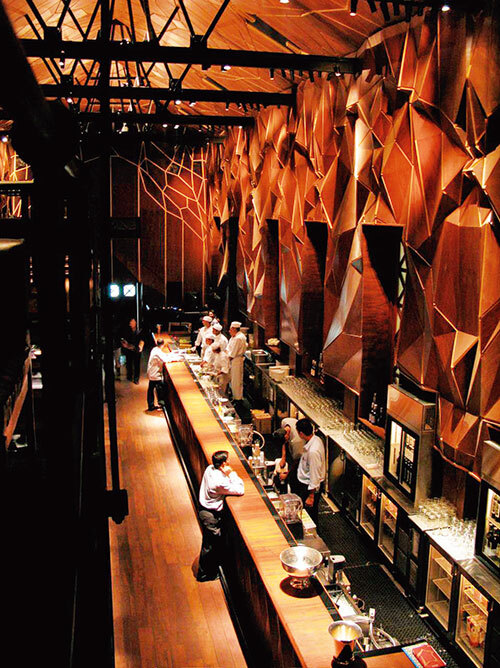 The walls have been crafted from special Izumiya stone from Japan, by a Japanese craftsman. The terrace area boasts a landscaped tree and water bodies around the periphery. Artefacts like Hoglund jars and traditional Chinese copper pots dot the eatery which is divided into several spaces. The central dining area provides a ‘gourmet theatre’ feel while the private and semi private dining spaces meander around the sushi counter and teppanyaki grill. The island bar with high bar stools is a destination in itself. The Japanese section offers interactive dining around cooking grills. Something for everyone here, wouldn’t you agree? 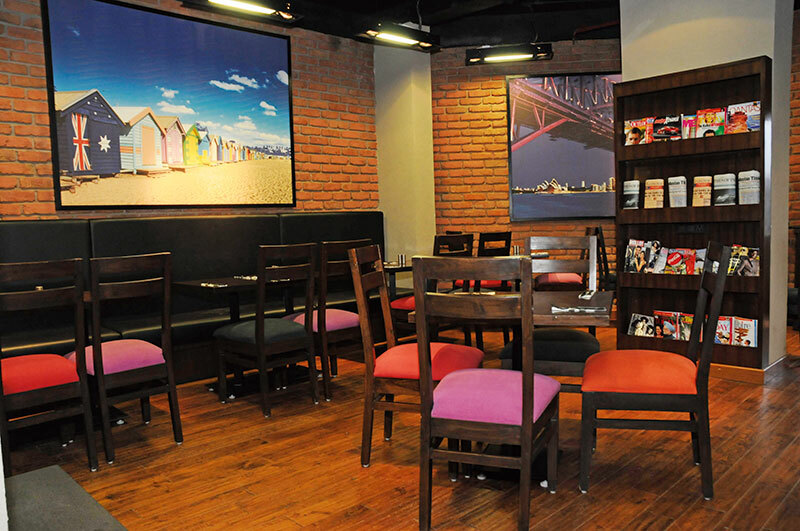 Tote on the Turf is restaurateurs Malini and Rahul Akerkar’s newest offering to Mumbai city. Nothing can beat it for its sheer sprawl and space in a metropolis that is normally afraid to breathe. The venture brings together al-fresco dining, an exclusive bar and restaurant and a versatile 8,000 square foot event space that can be used as one large space or divided into smaller options, with or without open-air garden areas. 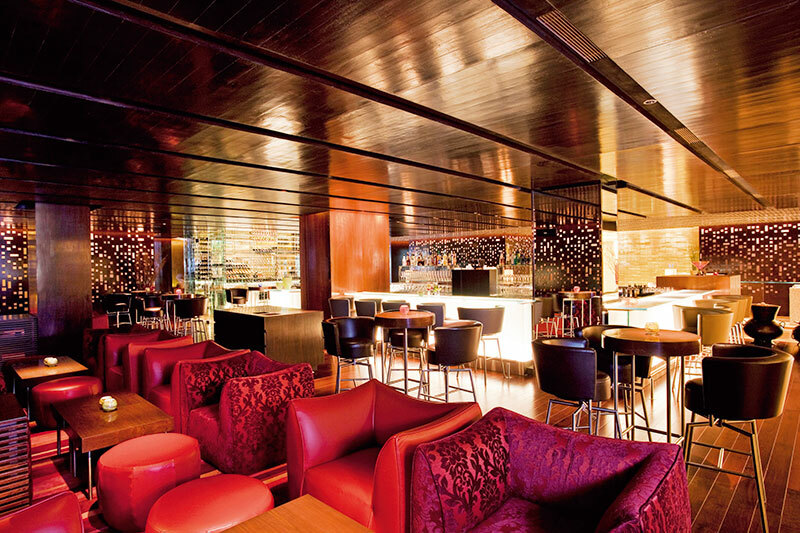 The bar is spectacularly large with intricately faceted, polished, teak panelled surfaces, like being in the inside of a tree. Two wrought iron mezzanines are suspended from the ceilings. Move to the restaurant at the ground level to imbibe meals that derive flavours from the wood burning ovens and grills of the open-plan kitchen. The cuisine presents a modern approach to classic flavours, very much like the design itself. Plush-contemporary would describe the interiors perfectly. Royal, perhaps, if one takes into account the hard-to-miss regal ‘throne’ that dominates the décor and very often, the dinnertime conversation. 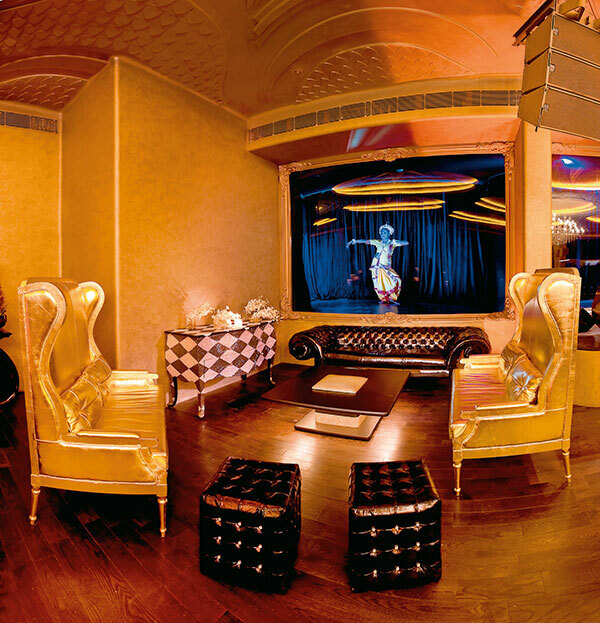 South Bombay’s newest lifestyle destination, Valhalla, is a place of many concepts. Business lounge by day, the restaurant and tapas bar offers two boardrooms as well, for six to 20 people, with WIFI, projector, plasma TV, photocopier, fax and even laptops on hire. The ideal place for a working power lunch. The main restaurant too will offer a ‘business box’ with stationary for note-taking if required. The menu proffers ‘world cuisine’ with a Spanish influence. 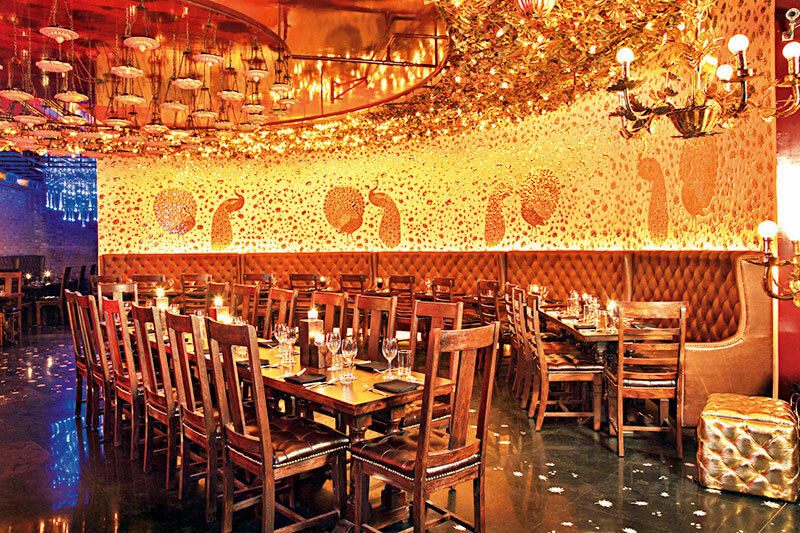 “Tapas style food is a great way to eat socially,” says Tricia Batliwalla, director, Valhalla. Tapas rules (try the delicately flavoured beetroot ravioli or mushroom assorti) while weeknights may see customers preferring Valhalla’s fine dining options for a sit-down dinner. (The pot roasted snapper and braised lamb are scrumptious.) Weekends, the place buzzes at the trendy lengthy bar with the popular fruit Martinis in focus, attracting the young, the hip and happening. Sunday afternoons are for families and friends in relaxation mode, spending hours over a lavish spread – a buffet meant for those who love to linger over a leisurely repast. And, there’s more – healthy breakfast in the making and high tea with scones and sandwiches for laid-back afternoons. Brick walls, wooden floors and black leather seats invite you to relax and lounge in true Australian style. Smart red and white interiors are offset by bright pop art graphics and colourful frames from Down Under. The second floor boasts a semi-translucent ceiling which makes the place bright as a summer day in Sydney. This Australian style café will have you spouting a warm ‘G’day Mate’ even as you down a potent Flying Kangaroo or Café Sydney, cocktails inspired by the land of Oz. Or while you dig into hearty Aussie favourites like herbed chicken schnitzel, fish and chips and grilled beef tenderloin. Not to forget the desserts and pastries. Spread over 17,000 square feet, LAP is actor Arjun Rampal’s first entrepreneurial venture and is in partnership with restaurateur A D Singh. Rampal’s vision has been brought to life by architect Sandeep Khosla. This fine dining restaurant, bar and exclusive members club opens up a world of decadence and style. Its distinct art deco undertones are echoed in the sweep of the curved bar and seating designed for stylish lounging. A magnificent chandelier especially commissioned from Swarovski Elements draws the eye, its crystals glowing honey and amber. Seating clusters are lit by lamps shot through with portraits of Rajahs of yore. 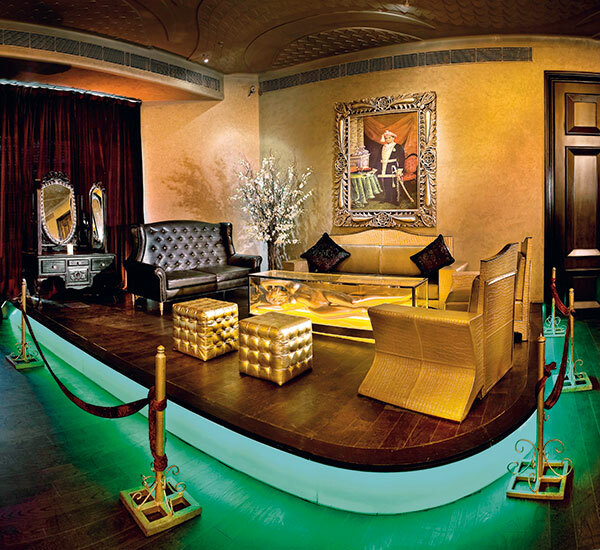 The highlight remains the tables that have been designed by Arjun Rampal, Gauri Khan, Tarun Tahiliani and Rohit Bal. Now, what can get more exclusive than this?